Charlie Yeomans, Head Groundsman at the University of Warwick has chosen a Dennis Razor Ultra 560 mower for his cricket wickets. 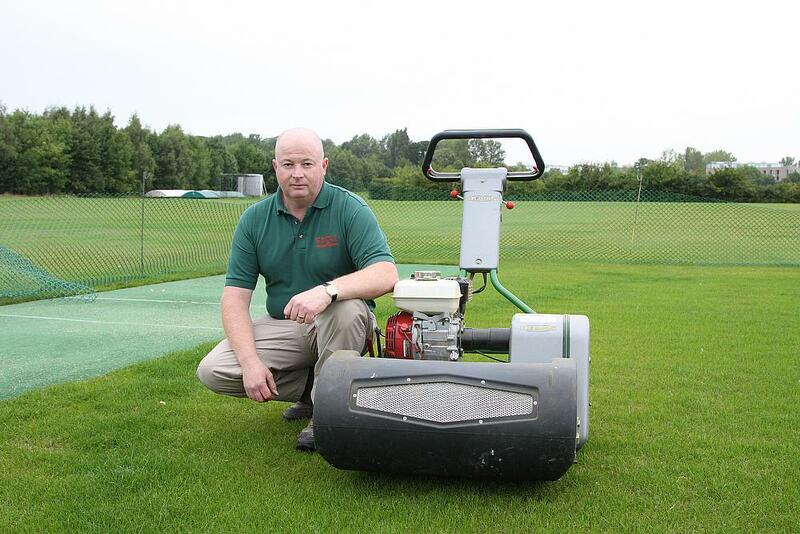 The proven reliability and consistent finish achieved by Charlie Yeomans, Head Groundsman at the University of Warwick and his existing Dennis cricket wicket mower made the British manufacturer the obvious choice when he was looking to purchase a new model. Charlie, who has worked at the university for over 25 years and been Head Groundsman for 6 years, chose to purchase the Dennis Razor Ultra 560 for his cricket square. He is kept busy looking after the vast sports facilities at the university preparing surfaces for students and staff including football, rugby, American football, lacrosse, athletics, tennis, hockey and cricket. “We can put any sports event on for anyone that asks. There is nothing that we can’t do. It’s important that we have the best turf maintenance machinery available because our students expect the best playing surface,” commented Charlie. “I first saw the Razor Ultra at a dealer demonstration day a couple of years ago and was very impressed from the moment I saw it. I liked the weight at just 130kg and its ease-of-use and especially the tungsten tipped groomer which really takes care of lateral growth. The Dennis Razor Ultra 560 has been developed to specifically meet the demands of cricket pitches as well as golf greens & tees and bowling greens. The machine has a 560mm (22”) cutting width and incorporates many key features including an 11 bladed cutting cylinder, ultra short wheelbase for undulating surfaces, tungsten tipped groomer, compact handle design for extra manoeuvrability, click height adjusters and stub free transport wheels for easy transport from site to site. The university closes the cricket wickets at the end of August in order to produce good growth in preparation for the following year and the Razor Ultra has been used at the university for the past six months in order to maintain a high quality wicket. Charlie has worked with a Dennis for over 15 years and sees the new purchase easily lasting ten years: “I will get ten years out of this machine, if not more. They are so well built and I see myself always using them. “I’ve had brilliant service from Jason Briggs, the Area Sales Manager as well as Dennis. They are always helpful and extremely informative,” said Charlie. For more news, reviews and insightful views, you can follow Dennis on Twitter @DennisMowers and like the company’s Facebook page – www.facebook.com/DennisMowersUK. You can also view the latest Dennis videos by visiting www.youtube.com/DennisMowers.